Atacamite is well known as a strong stone for the higher chakras and in many people it is known to dynamically act to aid them to open their third eye. You may find that even holding it in your hand you may make contact with the spiritual realm and its action is well known to aid you to develop psychic abilities. 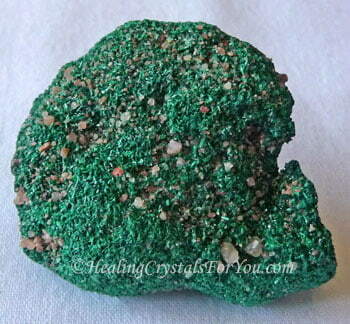 Many people who work with this green stone speak of its action to help them to have amazing psychic visions. 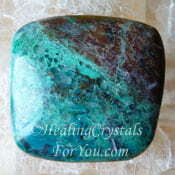 One of the best ways to use this stone is to meditate with it every day. This stone was discovered fairly recently, and many people are working with it to fully discover its qualities. 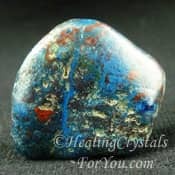 What is known is that it has an excellent healing action within the throat chakra and is also a strong heart based stone, assisting you to attract love into your life. 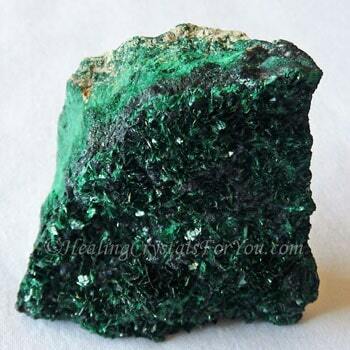 The meaning of the name of Atacamite relates to the area where it was first found. It was named for the Atacama Desert in Chile, but since then it has also been found in Mexico and the USA, as well as in quite a large number of locations in Australia. 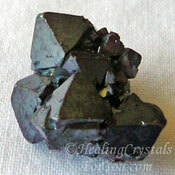 Many pieces have lovely green crystals, located on a deep brown matrix. 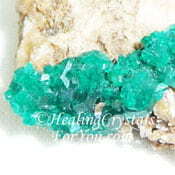 In these specimens, the strength of the matrix stone, on which the crystals sit also has strong energy. The weathering of the stone in quite arid desert conditions is believed to have created it. Many specimens of Atacamite are very beautiful, with some having deep green crystals interspersed within the matrix as well as on top of it, which is quite attractive. 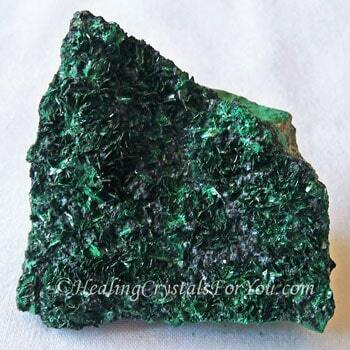 If you look at the image of the stone below you will see lovely glittering dark green crystalline areas, along with the lighter green areas. The actual crystals may also be on top of a base mineral. 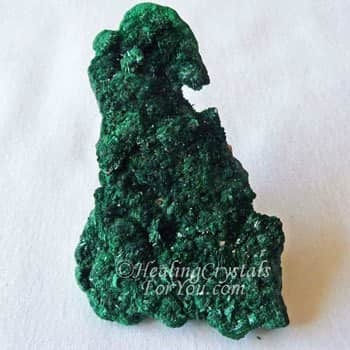 Many specimens of Atacamite seem to be more copper based, with clearly and predominantly green color in them, although they may have some small blue areas within the stone. It may have a similar look to Chrysocolla on some parts of the stone, and is known to be a mixture of various minerals, coming to together to create a totally new stone. 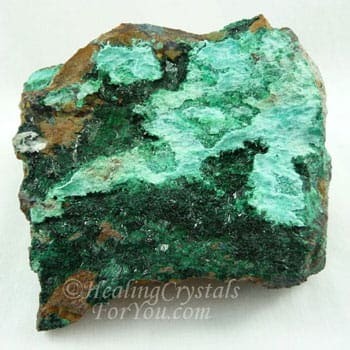 It is said to be related to quite a few stones, and like Azurite, Chrysocolla, Malachite mixtures, and like many copper based stones it may have different minerals entwined within the stone. This is a stone that may come combined with various other natural crystals that may affect its overall vibration, and be of benefit to you. While using Atacamite Stone and experiencing many of its spiritual characteristics, you get a feel for its overall metaphysical qualities. Used within the throat area it aids communication and self expression. It is said to aid the immune system and the thymus gland, and will assist the thyroid gland and bring energy to the body. 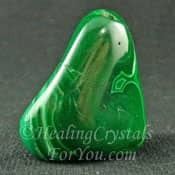 This is a beautiful stone that promotes confidence and self motivation from a heart based perspective, and also brings an increase in feelings of enthusiasm and independence. What we also know is that in a number of people it can forcefully open the third eye, and it is known to aid them to experience extraordinary psychic visions. The vibration of this stone allows you to ground your energy to the earth star chakra, as well as taking you to the highest levels. It works within the heart and the higher heart or thymus chakra, aiding you to attract more love into your life. 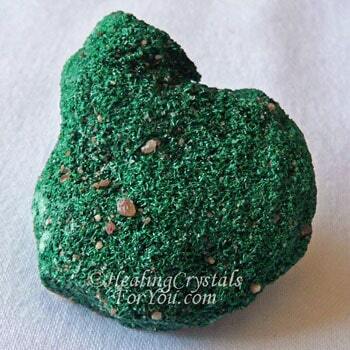 Most green stones will have heart chakra energy, yet my experience of this stone is that Atacamite seems to work on all of the chakras. Its unique energy will resonate within the the thymus or higher heart chakra, the heart chakra, the throat chakra and the third eye chakra, all areas that aid your spiritual growth. It is one of the birthstones for the Sagittarius star sign, so it is will of course be found on the list of all of the birthstones that relate to the zodiac. 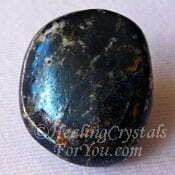 This stone is helpful to develop your creativity and may boost altruistic feelings. It is also said to strengthen both the male and female reproductive organs and it has a good action within the lower chakras. They are beneficial healing crystals for you to use especially within the sacral or navel chakra. Used there, the energy of these stones may be especially helpful as it's vibration works to help the kidneys. They are known to aid elimination, especially of fear based toxins. As more and more of the stone is made available you will find it will be sold as jewelry. This deep green color is quite prevalent among most specimens, but there have also been pieces found with various other colors within them. Colors include blues and reds with the green, which would make lovely jewelry. It's energy also may help to eliminate herpes, so if this is a problem for you it might be of value to you. It has a lovely feel to it, and although it does have an amazing energy within the higher chakras, it has a definite heart chakra energy. When using it for meditation it would be beneficial to use it fairly gradually until you adapt to its energy, especially if you have not experienced strong energy before. 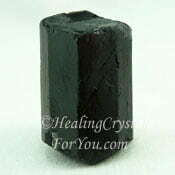 It is an excellent stone to use when you are doing your daily crystal meditation, as this allows you to make use of its more impressive nature. As it is likely to take you to the higher realms, you may become ungrounded. If you find you are dizzy or feel spacey, make sure you hold one of the strong grounding stones in your hand afterwards to ground you. 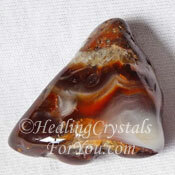 You may find that when you pick it up, your psychic hearing or clairaudient abilities may come to life. This can happen straight away in some people, particularly when clairaudience is your primary psychic gift. It is said that if you have not already opened your third eye that it will forcefully do this, and it may aid you to more easily achieve contact with your spirit guide. 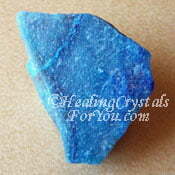 It is a stone that I recommend for anyone who wants to develop their clairvoyant abilities. 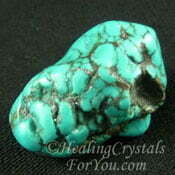 It brings through powerful visual images, even if it is not your predominant psychic gift. It is known to help you to 'see' more clearly, via your psychic vision. So this is a powerful advantage for those who desire to heighten their experiences of this ability. It works at the third eye chakra and within the pineal gland, and will intensify your connections to your higher self and to your guides, as your psychic visual abilities open more fully. If you use it for a short time each day, you may adapt more easily to its energy, and have less side effects. 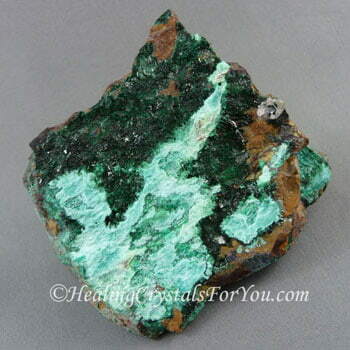 As we learn more about Atacamite crystal and more of the stone becomes available, it will be a stone that will be widely used, as it works on so many areas at the same time. 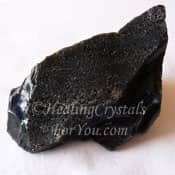 I believe that this stone has come to our attention at this time because it is needed by all of us, as we head forward into this decade, working on our overall spiritual development and ascension. We are reborn into this world every time we wake, and there is daily a chance to make a new start, and live a new life. Are you looking for a book about using crystals and don't know the best one to choose? There are quite a few crystal books now selling and some are better than others. Some are very in-depth crystal reference books, others not so much. 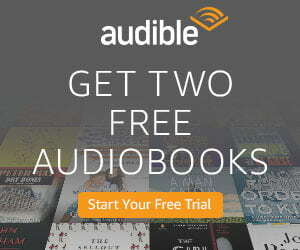 I cover many of the best selling books on my review page. Most of the authors have been in the crystal industry for many years, and any one of their books are good to have on hand. 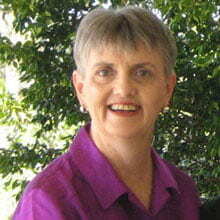 I love Judy Halls Crystal Bible series, three books so far and all are great to have on hand. Judy has also written a number of other useful and interesting books on other aspects of crystals and how to use them, including one of my favorites on Crystals & Sacred Sites. Click Here to read reviews of many of my favorite Crystal Books. Some of the best stones to combine with it would be Black Obsidian, Fire Agate and Black Tourmaline, as these are also very protective against psychic attack. Even though this stone has a grounding vibration, if you are using this stone for spiritual development it would be a good idea to also use grounding stones. Are you ungrounded? Check out the symptoms of being ungrounded, especially if you have been using high vibration stones a lot. 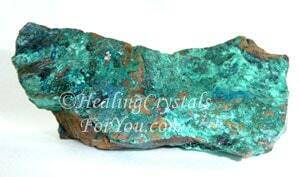 The vibration of both this stone and other copper based stones will be magnified by combining them together. You may like to combine this stone with any of the other copper based stones. This includes crystals such as the lovely Ajoite in quartz, Green Dioptase, Turquoise, Covellite, Eilat Stone, the stone of King Solomon, Malachite, Shattuckite, Gem Silica, Chrysocolla or Cuprite. Many areas within these stones look very much like Chrysocolla, which is said to be one of the minerals within Atacamite. 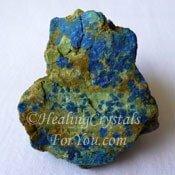 The addition of the energy of Chrysocolla in many specimens may be why it is known to have strong heart chakra energy, and they are excellent used together.